Golf De Wimereux is one of the only true links courses in France, the area was once a popular choice for the British gentry, leading to the creation of a layout to rival the legendary links in the UK. The course was first created over 100 years ago but has been changed many times, leading to the spectacular design there today. Located between Calais to the north and Le Touquet to the south, Wimereux is ideally situated for any UK golfer visiting Northern France, a popular option is to play it on the way to or from a weekend in Le Touquet. Ranked in the top 50 courses in France, it is a layout worth playing in its own right. 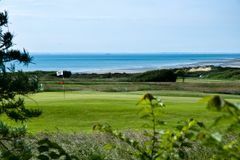 Wimereux's classic seaside layout is truly spectacular, with views across the Channel to the white cliffs of Dover, and is a golf course of international repute. Many prestigious professional events have been staged at the 6,726 yard layout, which is punctuated by devilish pot bunkers, and is an exceptional golfing experience as part of an escape to France's nearest coast. Nice links course. The fairways were fast but the greens were perfection - find them and your ball would hold. The wind made some of the holes a real challenge. It was a bit slow going but not too bad. Great views of the sea and some interesting WWII bunkers to investigate!